Health Minister Rajitha Senaratne told a news conference that all the bombers were Sri Lankan citizens. Earlier, a government forensic crime investigator said an examination of the Islamist attackers’ body parts showed that they were suicide bombers. [...] The bombings, Sri Lanka’s deadliest violence since a devastating civil war ended a decade ago on the island nation, killed at least 290 people with more than 500 wounded, on Easter Sunday. Most of those killed were Sri Lankans. But the three bombed hotels and one of the churches, St. Anthony’s Shrine, are frequented by foreign tourists, and Sri Lanka’s Foreign Ministry said the bodies of at least 27 foreigners from a variety of countries were recovered. The bomb attacks in Sri Lanka have claimed the lives of three of the four children of the biggest shareholder in fashion e-tailer Asos. A spokesman for Anders Holch Povlsen, a Danish billionaire and Scotland’s largest private landowner, told multiple news outlets that the siblings were among the 290 people known to have died in a string of explosions. The senior officials demanded answers from President Maithripala Sirisena on how much information they had about the radical Islamist threat and why police were unable to prevent it from happening, directing attention from the six bombings on Easter Sunday – with a mounting death toll currently standing at 290 – back to the constitutional crisis that paralyzed Sri Lankan politics late last year and left the country with a president and prime minister running nearly parallel governments. Whoever the officials were who failed to warn of the tragedy that took place, they will have to pay a very heavy price for the horror they enabled. This is another case of security officials not proving themselves worthy of the job they were given. A California judge fined an Orthodox Jewish rabbi over $6,000 last week for reporting the vandalism of his synagogue to the police, reports First Liberty, a legal organization that says it is devoted to protecting the religious liberty of all Americans. “This is an outrageous decision that penalizes a rabbi for simply reporting a crime that he witnessed,” said Stephanie Taub, a senior counsel to First Liberty. First Liberty said that its attorneys will appeal last Tuesday’s court decision. Naturally, this is most extremely disturbing that not only were charges dismissed against the vandals, but one of the offenders was even allowed to sue the rabbi and the judge awarded her money! They most certainly must appeal the ruling, and the rabbi shouldn't pay any dough to the offender, whose felonies the judge practically suggests he condones. Absolutely disgraceful. Internal Security Minister Gilad Erdan has instructed not to allow a soccer tournament to take place in Jerusalem on Friday. The match was sponsored and funded by the Palestinian Authority and organized by members of Hamas, meant to mark Palestinian Prisoners' Day. Erdan said that "I will not allow an event that glorifies terrorists and violate the Israeli sovereignty to take place in Jerusalem, our capital." The minister signed an order to close the tournament that was supposed to take place on the football field in Beit Tzafafa, in the capital. In the past, Erdan extended the order to close the Orient House building and other institutions of the Palestinian Authority in east Jerusalem. In recent months, he issued closing orders for a commemorative event in east Jerusalem financed by the Palestinian Authority, for a conference in Silwan that promoted the Palestinian takeover of east Jerusalem and other events Palestinian settlements planned for Jerusalem. According to Erdan, "The terrorists imprisoned in Israel are despicable murderers, and their praise by the Palestinian Authority and Hamas demonstrates their intentions. The Palestinian Authority has been trying to strengthen its presence in East Jerusalem in sophisticated ways, including significant funding for its own activities. Intelligence forces and the Police are constantly working to trace these attempts and stop them, and I will continue to strengthen Israeli sovereignty throughout Jerusalem and prevent any Palestinian attempt to create a foothold in the city." A good way to cut down on these acts of infiltration would be to confiscate the Orient House altogether, and turn it into a museum dedicated to exposing evil. Simply don't give the PLO the chance to establish a foothold with such a structure. When German President Frank-Walter Steinmeier visited Israel in May 2017 (his first visit to the Jewish state since taking office five months earlier), he used the opportunity to pay his respects to Yassir Arafat and lay a wreath at the arch-terrorist's mausoleum in Ramallah. In February, President Steinmeier sent a congratulatory telegram to Iran's mullah regime in honor of the 40th anniversary of the Islamic revolution, in the name of Germany's citizens: "Mr. President, on the occasion of the National Day of the Islamic Republic of Iran, I congratulate you, also on behalf of my compatriots." And, of course, there's Merkel's own terrible policies as the premier to ponder. Read the rest of the article for more. Why is it important to examine the legal status of Jerusalem? Amb. Ichay: "We are used to the Jewish people justly claiming powerful religious, emotional and historical rights to Jerusalem – while archaeological finds, the Bible and Roman writings make that truth self-evident – but we are just as used to the Arabs (and their willing UN helpers in UNESCO and other organizations) totally denying Jewish history, ignoring- if not destroying - archaeological finds and claiming that the city and the Temple Mount are holy only to Islam. "The legal claim to Jerusalem, in contrast, is based on facts, but years of listening to unsubstantiated and downright false statements purporting to be truth have made most people unaware of the legal truths. "Also, the international talk is predominantly legal. We seem weak because we talk history and religion, which the world sees as debatable in the first case and contested in the second. "Let's face it, the whole world sees us as criminals, so that the very fact of starting a debate is a healthy development. The elite echelons are still against us but the conference brought about a change in that the ring is not empty anymore, not totally one-sided anymore. There is still a dispute, but there are two sides to it." Reading this, I'll admit that legalities should be taken into consideration, as it definitely could be of help in ensuring Jerusalem's safety. So, good that she's brought it up. Does this "religiously observant" fashion photographer really have such a lack of confidence? [Tal] Abudi is based in Tel Aviv but works regularly in New York and Los Angeles, and – unusually for the world of high fashion – is a religiously observant Jew. He has said in interviews that he will only photograph models who are dressed in a modest way – as Teigen was in the images. Oh, for heaven's sake! What good does this do? Does he really lack confidence in himself to avoid viewing a woman only as sexual if she's not dressed modestly? I'm sorry, but I decidedly can't appreciate his laughable vision, which only makes observantly Orthodox, as I'm sure his leanings are, look like nervous nillies turning to moral panics. What isn't clear is whether he's a Haredi, but even if he's not, his example is still not a good one. It's entirely possible to view a woman in a non-sexual way even if she's not modestly dressed, and also entirely possible to recognize that sexuality is not an inherently bad thing. That photographer, unfortunately, hasn't proven he's capable of understanding that. Well if the chances were high the youngster would've wound up going on the trip without needing the parental permits, it's understandable they'd want to keep him out, but these corrupt officials will simply not get the message nobody sensible likes indoctrination. And this is a country that, last time I looked, also forbids homeschooling. Justice Minister Ayelet Shaked (New Right) bid adieu to the Justice Ministry Wednesday morning, at a special goodbye party arranged in her honor. Shaked, who was left out of the 21st Knesset after the New Right party narrowly failed to cross the 3.25% electoral threshold, said that she would be leaving politics, but hinted at a possible return in the future. She may not be as responsible as Bennett is for their fiasco, but still, it's best for now she leave if that's how to apologize for doing something entirely avoidable. Benjamin Netanyahu's own son even blamed Bennett for costing votes for the right. Shaked may be easier to forgive, provided she take a sufficient amount of time off, and that she return to the Likud if and when she does come back. The New Right will remain out of the 21st Knesset, after no major problems were found in dozens of ballot boxes reviewed a second time at the request of New Right leader Naftali Bennett. Hundreds of New Right volunteers spent days poring through ballot protocols to try to find flaws that would help the party get into the Knesset. New Right was only about 1,400 votes below the 3.25% electoral threshold. Education Minister Naftali Bennett conceded that he had lost his Knesset seat and that the New Right party had failed to clear the electoral threshold. "I did the best I could for my beloved people," Bennett wrote in a Facebook post Tuesday evening after the Central Elections Committee found that the New Right had gained less than 50 votes in the latest recount and remained over 1,400 votes shy of the electoral threshold. "After six years of kosher service, 100 campaign days and another week of struggle for every voice, I can say: I did the best I could for the people of Israel, my beloved nation," Bennett said. "This time it was not enough. "I have no complaints to anyone. I and I alone are responsible for the result. New Right leaders Ayelet Shaked and Naftali Bennett will reportedly part ways following a surprisingly poor election showing last week that saw the party fall just short of the votes needed to get into the Knesset. Sources close to the two lawmakers told Channel 13 news on Sunday that the pair, who have not been seen together since the final election results were released on Thursday, would soon dissolve their political alliance. According to some reports, Shaked could join the ruling Likud party. The New Right had one of the most disappointing performances of the 2019 election. The two popular pro-settler ministers split from their religious-nationalist Jewish Home party and sought greater power by appealing to new secular voters, but the maneuver backfired. "Popular" is disputable at this point. They weren't even properly organized for a separate campaign, and if they hadn't thrown the United Right party under the bus, chances are together, they would've gained another seat or two in the Knesset. Instead, they slapped many decent people in the face, and demonstrated they were more interested in grabbing votes away from Likud than getting more newcomers to vote for them. Which is super-cheap. What Bennett did makes me so furious. So if he kindly departs from politics, I think that'll make everyone feel much better. There may be some Americans donating to the repairs needed too (Update: for example, Apple Corporation). But going forward, sites like these will require much security, scrutiny and safety devices in order to keep these valuable artifacts safe. The authorities are still claiming it was not arson, but at this point, I wouldn't trust them one bit, and I'm sure plenty of others don't either. With so many Islamofascist attacks on churches lately, nothing can be ruled out. Yes, and what if it was a construction employee of Muslim adherence who was behind the fire? Will the press there cover that up in synch with the government/establishment's demands? If they do, it'll be one more example of their acceptance of evil. 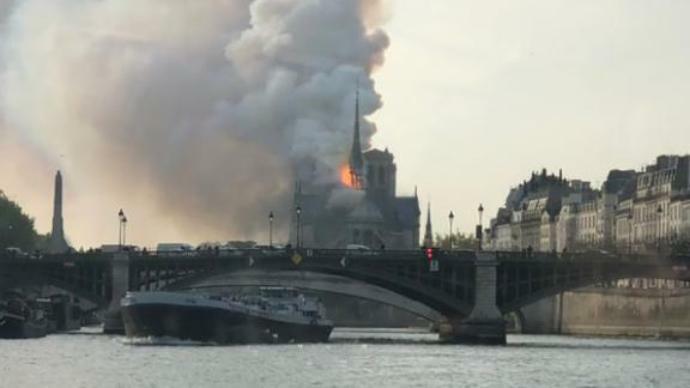 This is a most horrible, tragic arson case at a landmark location in France, no thanks to the tons of corrupt politicians who allowed the enemy into their country perimeters. Update: the spire collapsed 2 hours after the fire began, and the wooden interiors suffered serious damage. Update 2: the Israeli foreign ministry's announced solidarity with France during this tragedy. My sister is one of those people who had her vote wasted by a man whom I've come to view as an utter disgrace. To make matters worse, he even - at least initially - resorted to the classically cheap notion of trying to siphon voters from Likud, proving he lacked faith in his ability to convince voters on the left to try him out. After all the hard work Netanyahu did to get Jerusalem and the Golan Heights recognized by the US, and they return the favor by making it sound like he's suddenly going to turn traitor overnight?!? That was degrading. It goes without saying if Bennett hadn't split up, there might've been another seat or two won for the right-wing bloc, and he just had to ruin everything. And while Ayelet Shaked may not be innocent in all these mistakes either, she did do a positive job as justice minister, and now Bennett cost her a Knesset seat too. She may be able to rejoin the Likud, where she once worked, and even work as a non-parliament minister, but it still doesn't excuse the damage Bennett's wrought. Therefore, I honestly think it best for him to retire, and his grave errors serve an important lesson why you don't just simply divide the right, period, and you also don't act desperate for a neighboring party's votes instead of convincing the other side of the spectrum to try your platform. Update: Bennett's managed to get the central elections committee to do a partial recount of votes. We'll see how well things fare from here.